Although no contemporary evidence has been found to support the claim, it is commonly believed that "The Wednesday Cricket Club" was formed in 1820. Nevertheless, an 1842 article in Bell's Life magazine states the club was founded as far back as 1816. On the evening of Wednesday 4 September 1867, a meeting was held at the Adelphi Hotel to establish whether there was interest among the club's members to form a football club to keep the team together and fit during the winter months. The proposal proved very popular, with over 60 members signing up for the new team on the first night. They played their first match against The Mechanics on 19 October the same year, winning by three goals and four 'rouges' to nil. It soon became apparent that football would come to eclipse the cricketing side of the club in terms of popularity—the two sections went their separate ways in 1882 after a dispute over finances, and the cricket club ceased to exist in 1925. On 1 February 1868, Wednesday played their first competitive football match as they entered the Cromwell Cup, a one-off four-team competition for newly formed clubs. A week after their semi-final, they went on to win the cup, beating the Garrick club in the final after extra time, the only goal being scored in diminishing light at Bramall Lane. This was the first recorded instance of a match being settled by a "golden goal" although the term was not in use at the time. 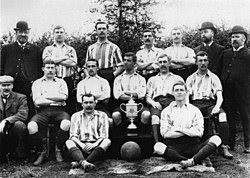 In 1880 the club entered the FA Cup for the first time, and they soon became one of the most respected sides in the country. But although they had had Lang on their books a decade earlier, the club officially remained staunchly amateur, and this stance almost cost the club its very existence. By the middle of the decade, Wednesday's best players were leaving in their droves to join clubs who would pay them, and in January 1887 they lost 0–16 against Halliwell with just 10 players in their team. An emergency meeting was held, and the board members finally agreed to pay its players. Owing to an expansion of the local railway lines, the club was told that they would have to find a new ground for the 1899–1900 season. After a difficult search the club finally bought some land in the village of Owlerton, which at the time was several miles outside the Sheffield city boundaries. Construction of a new stadium (now known as Hillsborough Stadium) was completed within months and the club was secured for the next century. In a strong decade, Wednesday won the League in the 1902–03 and 1903–04 seasons and the FA Cup again in 1907, beating Everton 2–1, again at Crystal Palace. When competitive football was suspended in 1915 because of the outbreak of World War One, the club participated in several regionalised war leagues, until 1919, when normal service was resumed. In 1961, the club ran toe-to-toe with Tottenham Hotspur at the top of the table for the majority of the season – Wednesday became the first team to beat Spurs all season – before finally finishing in second place, which still (as of 2019) remains the club's highest post-war league finish. In 1966 the club reached its fifth FA Cup final, but they were beaten 2–3 by Everton, having led 2–0. Off the field the club was embroiled in the British betting scandal of 1964 in which three of its players, Peter Swan, David Layne and Tony Kay, were accused of match fixing and betting against their own team in an away game at Ipswich Town. The three were subsequently convicted and, on release from prison, banned from football for life. The three were reprieved in the early 1970s, with Swan and Layne returning to Hillsborough, and, though their careers were virtually over, Swan at least played some league games for The Owls. Wednesday were relegated at the end of the 1969–70 season; this began the darkest period in the club's history, eventually culminating in the club dropping to the Third Division for the first time in its history, and in 1976 it almost fell into the Fourth Division. It was not until the appointment of Jack Charlton as manager in 1977 that the club started to climb back up the league pyramid. Charlton led the Owls back to the Second Division in 1980 before handing the reins to Howard Wilkinson, who took the club back into the top flight in 1984, after an absence of 14 years. Wednesday couldn't keep the forward momentum going however, and by the turn of the new millennium again found itself on the brink of relegation – a 3–3 draw at Arsenal in May 2000 was enough to see the Owls tumble into the First Division. Having spent large sums building squads that were ultimately ineffective, the club's finances took a turn for the worse, and in 2003 they were relegated for a second time in four years, to the Second Division. Between July and November 2010, Sheffield Wednesday faced a series of winding up orders for unpaid tax and VAT bills, with the club's existence under severe threat. It was not until 29 November 2010, when businessman Milan Mandarić agreed to buy out the old owners, that the club could move forward. Mandarić appointed former Wednesday player Gary Megson as manager partway through the 2010–11 season, and while Megson only stayed in the job for a year, what was mostly his side won promotion back to the Championship in May 2012, under the stewardship of new manager Dave Jones. In 2014 the club was again taken over by a new owner, Thai businessman Dejphon Chansiri, purchasing the club from Milan Mandarić for £37.5m. Chansiri stated his intention to win promotion back to the club for the 2017–18 season – the football club's 150th anniversary – and came close to achieving that goal a year head of schedule, with new coach Carlos Carvalhal leading the club into the end of season play-offs at the end of the 2015–16 season. Wednesday were beaten in the final by Hull City at Wembley. They made the play-offs again the following season, but lost on penalties to the eventually promoted Huddersfield Town in the semi final. 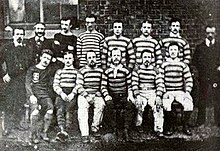 In their early years, the club was nicknamed The Blades, a term used for any sporting team from the city of Sheffield, famous the world over for its cutlery and knives. That nickname has been retained by Wednesday's crosstown rivals, Sheffield United. Although it is widely assumed that the club's nickname changed to The Owls in 1899 after the club's move to Owlerton, it was not until 1912, when Wednesday player George Robertson presented the club with an owl mascot, that the name took hold. A monkey mascot introduced some years earlier had not brought much luck. 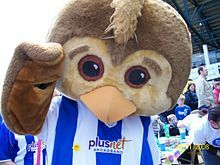 Over the years Sheffield Wednesday have had several Owl themed matchday mascots. Originally it was Ozzie the Owl and later two further Owls, Baz & Ollie were added. All three were replaced in 2006 by Barney Owl, a similar looking owl but with more defined eyes to make it look cuter. Ozzie Owl was reintroduced as Wednesday's main mascot during the home game with Charlton Athletic on 17 January 2009. The current mascots are Ozzie and Barney Owl. In 2012, Ollie Owl also made his return to the scene, as the club announced him Mascot for the Owls work with children in the local community. On 15 April 1989 at an FA Cup semi-final between Liverpool and Nottingham Forest, 96 Liverpool fans were crushed to death after the terraces at the Leppings Lane end of the ground became overcrowded, in what became known as the Hillsborough disaster. The following report concluded that the root cause of the disaster was the failure of local police to adequately manage the crowds. A memorial to the victims of the disaster stands outside Hillsborough's South Stand, near the main entrance on Parkside Road. After many years of dispute about the facts, in June 2017 six men responsible for safety were charged with criminal offences including manslaughter and misconduct in public office. In 1992 Wednesday were the fourth best supported team in the country, but although that ranking has come down since relegation from the Premier League in 2000, the club still has still enjoyed crowds of well over 20,000 since then, and was the best supported club outside the top flight in 2006. At the 2005 playoff final, Wednesday took over 39,000 fans to the Millennium Stadium. In 2016, Sheffield Wednesday took over 38,000 fans to Wembley for a play-off final defeat by Hull City, selling substantially more seats than their counterparts many of whom boycotted the game. The Owls have managed to average 30000 at home in the last 60 years. The FA Cup Final seasons in 1965/6 30000 and 1966/7 31000 plus 32000 when coming League Championship Runners Up in 1960/61. There are several online message boards dedicated to discussions on the club, including Owlstalk, OwlsOnline and OwlsMad. The 1993 FA Cup semi-final match which took place at Wembley on 3 April 1993. Initially, it was announced that the match was scheduled to take place at Elland Road but this was met with dismay by both sets of fans. After a re-think, the Football Association decided to switch venue to Wembley. A crowd of 75,365 supporters made the trip down to London to watch Wednesday beat United 2–1 after extra time in a match which Wednesday dominated heavily. The highest home attendance was in the FA Cup fifth round on 17 February 1934. A total of 72,841 turned up to see a 2–2 draw with Manchester City. Unfortunately for Wednesday, they went on to lose the replay 2–0. Manchester City won the FA Cup that season. The fastest sending off in British league football is held by Sheffield Wednesday goalkeeper Kevin Pressman – who was sent off after just 13 seconds for handling a shot from Wolverhampton's Temuri Ketsbaia outside the area during the opening weekend of 2000. The fastest shot ever recorded in the Premier League was hit by David Hirst against Arsenal at Highbury in September 1996 – Hirst hit the bar with a shot clocked at 114 mph. ^ a b "Hillsborough Stadium – About Hillsborough". Sheffield Wednesday Football Club. 26 June 2012. Archived from the original on 19 March 2015. Retrieved 9 May 2014. ^ Wright, Oliver (23 May 2014). "Hillsborough: The changing face of a tragic stadium". BBC News. British Broadcasting Corporation. Retrieved 15 December 2016. ^ "Ranking all 54 stadiums in Premier League history – where does Upton Park feature?". The Daily Telegraph. London: Telegraph Media Group. 10 May 2016. Retrieved 15 December 2016. ^ "Dave Jones to manage Sheffield Wednesday". BBC Sport. Retrieved 1 March 2012. ^ "Hillsborough". Sheffield Wednesday F.C. Archived from the original on 6 March 2009. ^ a b c d Dickinson, Jason (2015). The Origins of Sheffield Wednesday. Amberley Publishing. ^ Farnsworth, Keith (1995). Sheffield Football A History: Volume 1 1857–1861. Hallamshire Press. ISBN 1-874718-13-X. ^ "The Cromwell Cup". Archived from the original on 28 July 2012. Retrieved 15 August 2006. ^ "Players, Managers and Administrators". Sheffield Wednesday official website. Archived from the original on 2 May 2008. Retrieved 6 October 2008. ^ "In the Beginning". FL Interactive Limited. Archived from the original on 8 August 2007. Retrieved 8 April 2009. ^ a b c Farnsworth, Keith (1982). Wednesday!. Sheffield City Libraries. ^ a b c Young, Percy M. (1962). Football in Sheffield. S. Paul. ^ Adrian Bullock's Sheffield Wednesday Archive 1950s > yo-yo years. ^ Broadbent, Rick (22 July 2006). "Swan still reduced to tears by the fix that came unstuck". The Times. London. Retrieved 8 April 2009. ^ "BBC ON THIS DAY | 1989: Football fans crushed at Hillsborough". BBC News. 15 April 1945. Retrieved 31 January 2013. ^ "Hillsborough Thatcher files to be released by June 2012". BBC. 30 November 2011. Retrieved 31 January 2013. ^ Bolton, Andy (2 May 2012). "No.10 Hillsborough disaster | New Civil Engineer". Nce.co.uk. Retrieved 31 January 2013. ^ "Sheffield Wednesday". London: Guardian Unlimited fanzines. 20 November 2001. Retrieved 6 October 2008. ^ "Brighton 0–2 Sheff Wed". BBC. 17 April 2006. Retrieved 18 August 2006. ^ Fletcher, Paul (2 May 2010). "Sheff Wed 2 – 2 Crystal Palace". BBC. Retrieved 3 February 2011. ^ "Sheffield Wednesday served winding up order by HMRC". BBC Sport. 23 July 2010. Retrieved 16 May 2011. ^ "Sheffield Wednesday broker deal to avoid administration". BBC Sport. 7 September 2010. Retrieved 16 May 2011. ^ "Sheffield Wednesday served with second winding-up order". BBC Sport. 9 November 2010. Retrieved 16 May 2011. ^ "Sheffield Wednesday: Dejphon Chansiri targets Premier League". BBC Sport. 2 March 2015. ^ Dickenson, Jason. One Hundred Years at Hillsborough. ^ Spalding, Richard A. (1926). Romance of the Wednesday. Desert Island Books. ISBN 1-874287-17-1. ^ Bickerton, Bob (1998). Club Colours. Hamlyn. ISBN 0-600-59542-0. ^ a b c "Sheffield Wednesday F.C. Crest & Club History". Footballcrests.com. 27 November 2003. Retrieved 31 January 2013. ^ "1962 – Football Clubs and Badges card Sheffield Wednesday". Mike Duggan. Archived from the original on 27 December 2007. Retrieved 17 December 2007. ^ "Facts and Figures". Sheffield Wednesday official website. Archived from the original on 17 April 2008. Retrieved 6 October 2008. ^ "The Club Crest". A. Drake. Archived from the original on 18 October 2012. Retrieved 11 September 2006. ^ "The ASD Lighting Kop". Sheffield Wednesday Football Club. Archived from the original on 8 August 2008. Retrieved 18 May 2008. ^ "The Hillsborough Football Disaster". Hillsborough Justice Campaign. Retrieved 11 September 2006. ^ "Information relating to the Hillsborough Stadium incident 15 April 1989". Health & Safety Executive. Retrieved 11 September 2006. ^ Conn, David (28 June 2017). "Hillsborough disaster: six people, including David Duckenfield, charged". The Guardian. Retrieved 28 June 2017. ^ "Sturrock salutes fans". BBC News. 29 May 2005. Retrieved 18 August 2006. ^ "About War of the Monster Trucks". The Guardian. London. 20 November 2001. Retrieved 6 October 2008. ^ "Pressman sent for earliest ever bath". BBC. 13 August 2000. Retrieved 27 October 2008. ^ "First team 2018/19". Sheffield Wednesday F.C. Retrieved 1 February 2019. ^ "Josh Onomah checks in". Sheffield Wednesday F.C. 31 August 2018. Retrieved 8 September 2018. ^ "'All Wednesday' premiere tonight". Sheffield Wednesday F.C. 4 September 2018. Retrieved 8 September 2018. ^ "Michael Hector makes Owls loan switch". Sheffield Wednesday F.C. 31 August 2018. Retrieved 8 September 2018. ^ "Achraf Lazaar lands in S6". Sheffield Wednesday F.C. 31 January 2019. Retrieved 1 February 2019. ^ "Rolando Aarons joins Wednesday". Sheffield Wednesday F.C. 31 January 2019. Retrieved 1 February 2019. ^ "Rhodes joins Norwich on loan". Sheffield Wednesday F.C. 10 July 2018. Retrieved 8 September 2018. ^ "First team coaching staff". Sheffield Wednesday F.C. Retrieved 2 January 2019. ^ "Steve Bruce: Sheffield Wednesday appoint new manager". BBC Sport. 2 January 2019. Retrieved 2 January 2019. This page is based on the Wikipedia article Sheffield Wednesday F.C. ; it is used under the Creative Commons Attribution-ShareAlike 3.0 Unported License (CC-BY-SA). You may redistribute it, verbatim or modified, providing that you comply with the terms of the CC-BY-SA.